Holding a pyrite sun from Sparta, Illinois. Pyrite Sun invites you to celebrate food as a connection with nature and your pathway to health. Everything we eat depends on a collaborative web connecting microorganisms, minerals, soil, sun, air, and water with plants, animals, and people. We are alive because we breathe, eat, and grow. I plant gardens and grow food because I believe the transformation of a seed into a meal is the magic at the heart of civilization. I create meals as experiences to awaken the senses because I want us all to eat for our whole bodies. Not just eating food with more nutrition, but eating beautiful food with joy and attention. I empower my clients to to take agency over their own nourishment and healing because we change the world when we create our own health. Healing is a revolution. As a child, I learned about cooking from the garden when my grandmother would send me out to the field to pick the vegetables we would eat for dinner on her farm. The fruit she grew shined brightest through the alchemy of her pies. We picked dozens of kinds of fruit from the garden or in the woods, each for its own star turn in a pie. We made ice cream the slow, old fashioned way with milk straight from the dairy barn to top the pies. I savored every single bite because those dinners and pies were more than just dessert. They were a process and experience that connected me to my family's land, culture, and history. Now I grow much of my own produce and work with local farmers so that my ingredients are as vibrant, nutritious, and local as possible. I start with organic ingredients, artisan cooking techniques, and a love for the magic of the kitchen and garden. I want every bite to burst with flavor and nourish you nutritionally. More importantly, however, I hope to awaken your senses by reconnecting you with the experience of eating as an expression of how the food was grown and the importance of sharing a meal together. We eat for energy to live and fulfill our purposes. It matters what and how we eat because our lives depend on it. Let's really savor eating together. Every pie, salad, and meal I make is an offering through which I hope to create nourishing sensory experiences. Why? Because there is more to food than just calories or nutrients. Food is the entryway through which we nourish our entire body, mind, and spirit. Eating connects us to the earth, the sun, our bodies, history and each other. Food is the source of culture; civilization developed out of people working together to eat and share meals. Humans first used their creativity for agriculture and cooking. Eating is that essential, and the original art form. Pyrite Sun creates colorful, nourishing, and beautiful food so that you can feel good about how you eat. I think of each meal as an experience that integrates how we eat, cook, grow, share, heal, create, feel, taste, smell, and pay attention. Eating becomes how we digest life. Our culture spends a lot of time teaching us to feel bad about ourselves and what we eat. As though, if we were really "good," we would be very skinny and survive food valued only for its low-calorie and high-nutrition value. We have a tendency to label foods "healthy" or "bad for you," and our diets often center around counting calories and depriving ourselves, self-blame, and fear of food. It's easy to feed yourself big servings of "this is bad for me" and "I shouldn't be eating this but it tastes good," until our minds and mouths become confused about what is really good for us. A three week old bunch of conventionally grown kale might sound good for you on paper. But a just picked bunch of kale grown organically in biologically active soil will actually offer you much more vitamins and minerals. What if we ate the best possible ingredients from our own gardens and local farmers and then really paid attention to the beauty, colors, and flavors in our meals? What if everything you ate was full of care and color, love and beauty? What if we spent more time preparing and sharing meals together? Could we stop feeling bad and guilty about ourselves while we eat? Could we start feeding ourselves nourishing thoughts while we really pay attention to how our food grows and the flavors of vibrant, nutritious, and creative food? I think we can. I say it's better to eat pie made with fresh organic milk, eggs, butter, grains and fruit for dessert and feel good about it, than feed yourself shaming thoughts while eating a plate of processed, low-calorie, "healthy" food. Let's enjoy every ounce of bounty and beauty we can together. Let's honor ourselves and each other through how we eat. We are alive because we have the ability to breathe, eat, and grow. These three processes, in turn, connect us to all other living things. All living beings are dependent on the sun, the air, the earth, water, and each other. Breathing connects us to the oxygen provided by plants. We eat the sun and nutrients from the soil in every bite, as our food and oxygen depend upon the process of photosynthesis and symbiosis with microorganisms and minerals in soil. We grow as we breathe and eat. We grow as we cultivate our food, our creative power, our community, and our consciousness. Celebrating how we we eat also involves integrating the many parts of our lives. We are all connected. WHAT IS A PYRITE SUN? Pyrite Sun is named after the radial formations of pyrite known as pyrite suns. In crystal healing traditions, pyrite promotes abundance, health, self-worth, and manifestation of one's true purpose in life. Pyrite sun crystals hail only from Illinois. These radiant discs of iron pyrite formed 350 million years ago at the 300 foot level in a very narrow seam between layers of black shale and coal. Coal miners in Sparta, Illinois used to bring them up in their lunch pails, saving them from destruction during the mining process. Encased in a shale and coal matrix, a very difficult cleaning process unveils their hidden natural beauty. Now that all of the Sparta coal mines have closed, the limited existing samples reveal a glimpse into processes that occurred during the earth's evolution. Pyrite sun is one of the strongest, and most positive energy stones. The name is derived from the Greek pyros, meaning "fire," because it sparks when hit with force against stone or metal. It was used to create fire during the Stone Age, and has been revered as a magical and protective stone throughout human history. As an embodiment of fire, pyrite suns are believed to ignite metabolism, circulation, and overall health. Pyrite suns are particularly beneficial to the lungs and cellular repair by promoting oxygenation of the blood. Likewise, pyrite is known for promoting mental acuity by integrating intuition with attention, and creativity with analysis. In ancient healing traditions, such as Ayurveda, pyrite is said to be a powerful impetus for transforming the root of physical, spiritual, and emotional dis-ease. It facilitates tapping into your fullest potential and abilities as it protects you from negative energies and pollutants at all levels. Pyrite empowers the spirit and strengthens self-confidence. 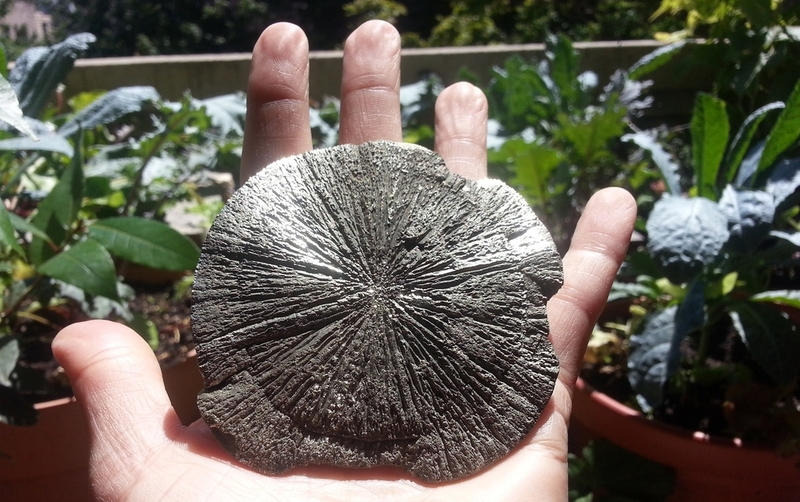 Like it's crystal namesake, Pyrite Sun encourages the life processes that connect us to the energy of the sun and earth as we breathe, eat, and grow. I'm Sarah Jane Mallin—chef, farmer, artist, and owner of Pyrite Sun. I create experiences and sensory art through food and gardens. 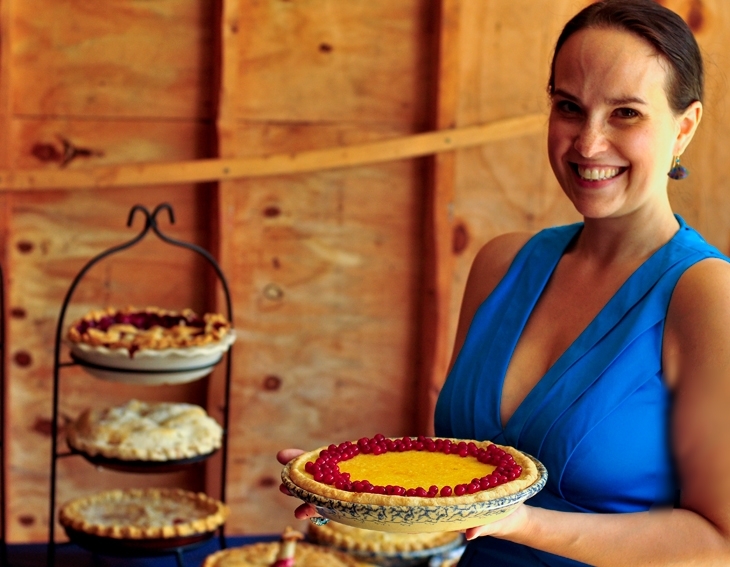 Pies, curated meals, colorful salads, and abundant edible gardens are the mediums I use to connect you more intimately with how you eat and how plants grow. I specialize in art and healing related events where the food interacts with the conversation and experience of an event. A thoughtful meal is an extraordinary opportunity to learn about each other and our own senses. I'm also a certified yoga teacher, specializing in personalized programs for mindfulness and healing from injuries. I'm a lifelong gardener that lives on sunlight and a strong connection to the earth. I am passionate about helping my clients enjoy how they eat and nourish themselves from the inside out. Healing comes from developing confidence and creativity in the choices we make. Through Pyrite Sun, and my personal practice, I wake up everyday excited to learn something new as I savor the beauty, flavor, discovery, and joy possible in every moment. For me, life is like making the best possible pie. We each start out with a circle for our lives like an an empty circular pie plate. The crust becomes tough if we work it too much. A tender crust requires a light touch, confidence, and commitment. The taste and nutritional value of the pie depends on the quality and balance of ingredients and flavors. We get to choose how we make our shell and what we put in the body of the pie. Only the best ingredients and mindful baking techniques will ensure that the delicate exterior works in harmony with a rich, fully-gelled, and satisfying filling. I would be honored to help you savor the beauty and flavors in your life as you develop a deeper connection to how you breathe, eat, and grow. At the very least, I want to make sure you eat a good piece of pie. Pie makes everything better.